Under the motto “be smart”, WITTMANN BATTENFELD will present numerous innovative novelties at the K 2016 in Düsseldorf from 19 to 26 October in hall 16, booth D22. The absolute highlight of this year’s K trade fair is the new UNILOG B8 control system, which is available for all machines of the PowerSeries. But the innovations in terms of machine technology are also quite noteworthy. Integration into the world of Industrie 4.0 is a recurring theme in the majority of exhibits on display. The new UNILOG B8 control system from WITTMANN BATTENFELD, demonstrated on an EcoPower for the first time at the 40th anniversary of the WITTMANN Group, will be shown on every single machine exhibited at the K in Düsseldorf. This new control system generation distinguishes itself from its predecessor version by several additional features and even greater operator comfort. Via an attractively designed, pivotable 21.5” full HD multi-touch screen, the process functions can be retrieved by gestures (zooming/wiping), while some selectable operating functions are triggered by tactile keys located in the machine’s central console. This makes it possible to address frequently used functions easily and directly. Visualization and operation of the machine run under the new Windows® 10 IoT operating system, which offers an extensive choice of options for a modern user interface and enables easy integration into the open world of Windows® applications. A display screen which can be partitioned allows simultaneous visualization of two different functions. This is a special advantage, since thanks to WITTMANN 4.0 technology, it has now become possible to visualize and operate machines and peripheral appliances in parallel via a single monitor screen. Assistant wizard and help systems support operators in machine setting and process optimization. With the new EcoPower Xpress, WITTMANN BATTENFELD introduces the development of a high-speed, all-electric machine model primarily geared to the requirements of the packaging industry. The highly dynamic drive axes for injection as well as closing and opening of the EcoPower Xpress are designed for fast movements and ultimate control accuracy. Moreover, extremely high energy efficiency is achieved by using servo drives. EcoPower Xpress stands for high output with optimized utilization of energy, thus making a vital contribution to sustainability in plastics processing. At the K show in Düsseldorf, the EcoPower Xpress will be on display with a WITTMANN W837 IML system. On the EcoPower Xpress 400/1100+, lids made of PP will be injection-molded within a cycle time of 4.7 seconds with an 8-cavity mold supplied by Greiner Packaging, Austria. 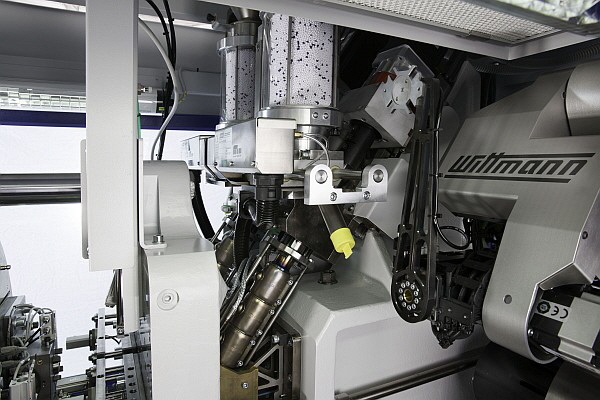 The W837 side-entry robot from WITTMANN inserts the IML foils, removes the labeled lids, subsequently presents them to an integrated camera for quality inspection and then separates the good parts from rejects. The IML system comes with compact design and a facility for fast foil change. The production of a hybrid structural component will be demonstrated at the K in Düsseldorf on an EcoPower 110/350, with a single-cavity mold supplied by IKV Aachen (Institute for Plastics Processing). In this application, thermoforming of metal sheet blanks will be shown combined with insert molding in an injection mold. The specially treated metal sheet blank is inserted into the mold by a WITTMANN robot equipped with the new R9 control system and thermoformed by a stamp during mold closing. The formed metal sheet is subsequently insert-molded with PA, and then the finished hybrid component is removed and deposited. With the new generations of control systems, B8 for the machine and R9 for the robot, the advantages of joint product development in the sense of “everything from a single source” have become very clear. Visitors will have an opportunity to witness the advantages of CELLMOULD®, the structured foam process developed by WITTMANN BATTENFELD, in a live demonstration on a MacroPower 1100/8800. This process, which enables the production of extremely light-weight parts with high rigidity and only minimal warpage, is of special interest for the automotive industry, where both the weights and the outward appearance of components play a vital part. On the MacroPower 1100, the production of an automotive part will be shown. The parts will be removed by a WITTMANN W843 pro robot with the new R9 control system, then subjected to quality inspection and deposited on a conveyor belt. As a special Industrie 4.0 highlight, the CMS (Condition Monitoring System) known as “Smart Services” will be demonstrated for the first time on this machine. Important machine status data are measured by sensors, processed by the machine’s control system and passed on to the company by an MES system for optimal maintenance planning. 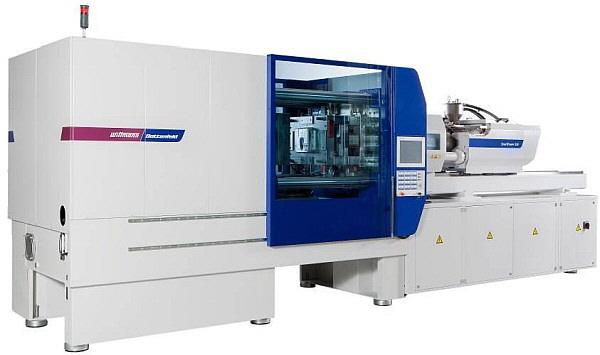 A further highlight at the WITTMANN BATTENFELD booth will be the MicroPower 15/10H/10H, the first 2-component model in the company’s MicroPower series specially designed for injection molding of micro and nano parts. On this machine, equipped with two parallel injection units and a rotary disk, a 2-component plug inside a sound recorder head made of PC and electrically conductive PC will be manufactured with a single-cavity mold supplied by Ortofon, Denmark. The machine is equipped with an integrated camera system and a W8VS4 Scara robot from WITTMANN for fully automatic quality inspection and parts removal. True to the motto “be smart”, WITTMANN BATTENFELD will present for the first time at the K 2016 the Combimould process (multi-component technology) on a machine from the servo-hydraulic SmartPower series. The SmartPower machines are currently available from 25 to 350 t as standard models and will be available with multi-component technology as well from K 2016 onwards. On a SmartPower 180/525H/210L, a drinking cap made of thermoplastic and liquid silicon will be manufactured with an 8-cavity mold supplied by ACH Werkzeugbau, using transfer technology. Parts removal and depositing will be handled by a W832 pro WITTMANN robot. Another interesting “smart” process will be demonstrated on a SmartPower 240/1330. In this application, PP preform parts for a 150 ml flacon are injected and inflated inside the mold with a 2-cavity mold supplied by Grossfiley, France. The mold comes with an index plate and consists of 3 stations. In the first station, the preform parts are injected, in the second, they are inflated and then ejected free-falling in the third. The SmartPower series’ generously dimensioned platen areas make it an excellent choice for multi-component applications. By extending the mold to 4 stations, the preform part could be overmolded with a second component to produce attractive multi-component blow-molded parts. On all exhibits shown at the K, networking of the machine and peripheral equipment with WITTMANN 4.0 will be implemented and demonstrated. Smart production with individualization and transparency according to Industrie 4.0 principles is the theme of the SmartPower 350 on display. The highlight in connection with this topic will be a fully automatic and integrated machine of the servo-hydraulic SmartPower series, on which trade visitors will be able to witness live the production of individualized plastic parts. On a SmartPower 350/3400, an attractive TPE shopping bag will be produced with a mold supplied by Haidlmair, Austria, which can be provided with a personalized imprint. At a terminal, all visitors can enter their names. To collect the bag with the personalized imprint, each visitor receives a printed voucher with a QR code, which can then be read in at the delivery station. After the QR code has been scanned in, the next bag produced will be separated and transferred to a station where it is laser-printed. After the fair, the production data of the “personalized bag” can still be retrieved by scanning the QR code for another fortnight. Handling of the bags will be effected by a WITTMANN W843 pro robot equipped with the new R9 control system. 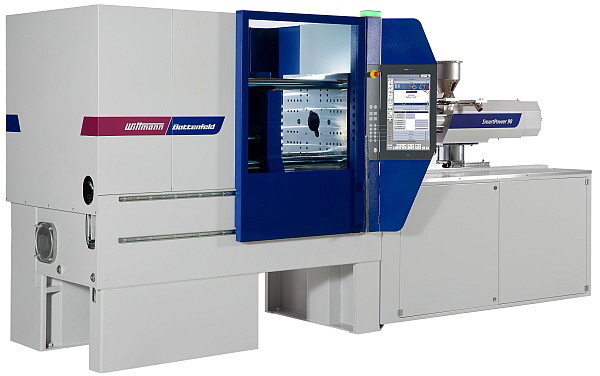 In addition to the machines from the PowerSeries, WITTMANN BATTENFELD will also showcase a vertical rotary table machine with an automation system at this year’s K. The CM 40/210 R1280 on display will be a machine from the new CM-R series with a rotary table and 400 kN clamping force. In the CM-R40, both the tie-bar-less clamping unit and the servo-controlled injection unit are arranged vertically. 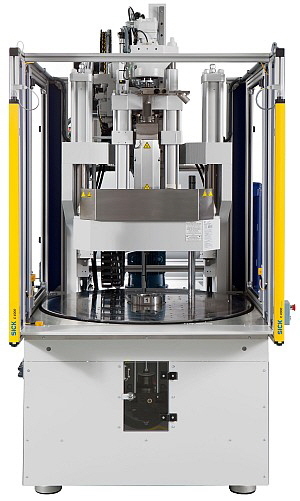 The vertical C-frame design with two symmetrical clamping cylinders provides maximum free space in the mold area and thus optimal accessibility. As already mentioned, networking of the machines with peripheral equipment under WITTMANN 4.0 will be implemented on all machines and equipment exhibited at the K. Via the new B8 machine control system, the machines as well as the robots and peripherals connected with them can be linked with each other and operated via the uniform Windows user interface. This enables interaction between the individual appliances, and the entire production process becomes optimally coordinated as well as transparent. 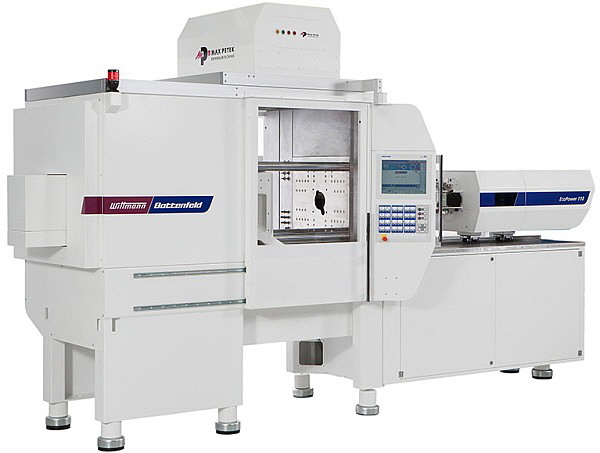 The WITTMANN 4.0 router, developed in-house by WITTMANN, contributes substantially to data security throughout the entire system. Only appliances which identify themselves unambiguously to the router by means of a security certificate are granted access to the production cell. 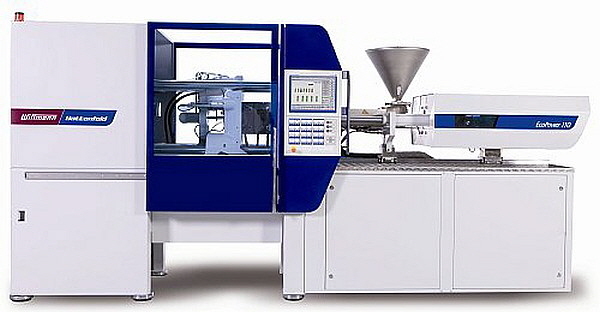 The router is integrated in the injection molding machine and linked with the connected peripherals as well as the customer’s network. 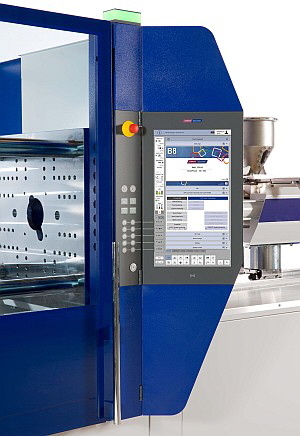 In this way, the WITTMANN 4.0 router dispenses with the manual allocation of IP addresses to the individual appliances within a production cell. This enables appliances to be plugged in and disconnected dynamically even while the equipment is in operation according to the principle of “plug & produce”. Moreover, this results in some advantages for connections to MES or ERP systems and/or access to the injection molding machine, robot or peripherals by means of OPC UA. Safe exchange of information with condition monitoring systems (CMS), remote control or the Windows-based Web-Service 24/7 from WITTMANN BATTENFELD is also ensured in this way. WITTMANN 4.0 technology opens the door to the world of Industrie 4.0 and makes a vital contribution to cyber security in production plants as well. The WITTMANN Group is a worldwide leader in the manufacturing of injection molding machines, robots and peripheral equipment for the plastics industry. Headquartered in Vienna/Austria, the WITTMANN Group consists of two main divisions, WITTMANN BATTENFELD and WITTMANN, which operate 9 production facilities in 6 countries, including 32 direct subsidiary offices located in all major plastics markets around the world. Visit us at the K show 2016. We are looking forward to welcoming you on our stand (hall 16, stand D22).